Orton was a music major at UNT who took up photography while living in Austin after college. During a visit to his parents' home in Nacogdoches, he discovered the existence of freedom colonies and became curious about the impact that their relative autonomy had on their families. He found the Upshaw family, which had 13 children, and told them he was interested in photographing them. The family agreed, and he began taking the documentary-style, black-and-white photographs the day after Thanksgiving in 1988. In one memorable photo, the patriarch Edward Monel Upshaw is being introduced to his great-granddaughter, Reya, less than a year old, who is crying. Other photos include the annual homecoming celebration that brings in family members from all over the country in August. The Lost Pines Art League is proud to present an educational and uplifting photography show about the exhibition The Upshaws of County Line follows one family from everyday events, such as a game of dominos, to important milestones such as births and funerals. 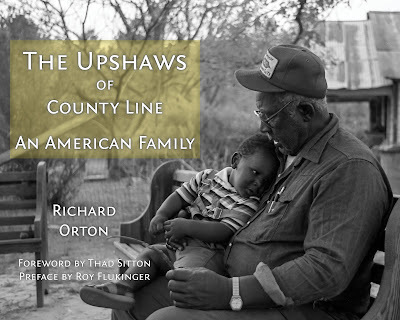 But what makes the Upshaws unique is where they lived — County Line, a freedom colony in East Texasformed in the 1870s by newly freed slaves on land that they owned. The photographs, taken by University of North Texas alumnus Richard Orton, will be on display through the end of October 2017 in Studio B at the Lost Pines Art Center. The show is brought to you by a partnership of the Lost Pines Art Center and through a grant provided by the City of Bastrop. The City of Bastrop has earned the title of the most historic small town in Texas. The exhibition, which covers 25 years, is based on his 2014 book of the same name published by UNT Press. "I watched family members being born and grow up," he said. "I watched people die. I took photographs of funerals. It was a very rare gift that I was able to do what I did there." Orton was a music major at UNT who took up photography while living in Austin after college. During a visit to his parents' home in Nacogdoches, he discovered the existence of freedom colonies and became curious about the impact that their relative autonomy had on their families. He found the Upshaw family, which had 13 children, and told them he was interested in photographing them. The family agreed, and he began taking the documentary-style, black-and-white photographs the day after Thanksgiving in 1988. In one memorable photo, the patriarch Edward Monel Upshaw is being introduced to his great-granddaughter, Reya, less than a year old, who is crying. Other photos include the annual homecoming celebration that brings in family members from all over the country in August. "What I hope that it does is convey some sense of what it was like to be raised in a community like that," Orton said. "The children were not subject to all the negative aspects of the Jim Crow reality of the day. By virtue of fact they owned their own land, they automatically had their own independence." The Lost Pines Art League (Lost Pines Art Center) is a 501(c)(3) nonprofit organization and runs the Lost Pines Art Center. Its membership includes a diverse set of artists and supporters of the fine arts. The City of Bastrop is a historically significant city and the county seat of Bastrop County, Texas, United States.